Kids are fascinated by essential oils diffusers. They love moving their hands through the plume of diffused air and breathing in the jet puff that the diffuser emits. Don’t believe me? 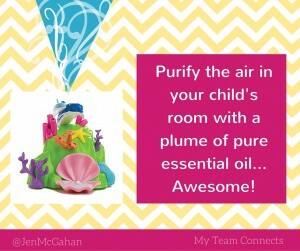 Put a diffuser in any room and see if your child is not immediately drawn to it! Finally, there are diffusers made just for kids. Young Living came out with these last summer, and there’s no doubt these will be a big hit this holiday gift-giving season. The same health benefits come in a new child-friendly package, including lights and colored plumes! I’m sure it will be the coolest gift under the tree this year for kids — and even some young-at-heart adults. features a playful mother dolphin and her calf swimming through color-illuminated vapor released by pink sea sponges. 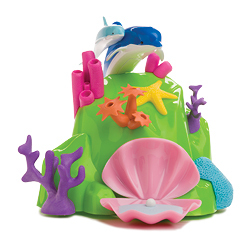 The colorful coral, starfish, sea anemones, and a pearl-bearing giant clam will captivate your children’s imaginations and transport them into an undersea wonderland, all while enjoying the benefits of diffusing Young Living’s 100% pure, therapeutic-grade essential oils. 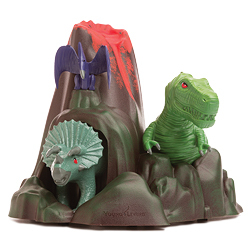 features color-illuminated vapor “erupting” from a prehistoric volcano, surrounded by menacing T. rex, triceratops, and pterodactyl figures. 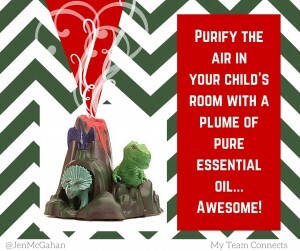 Captivate your children’s imaginations and transport them into a Jurassic wonderland, all while enjoying the benefits of diffusing Young Living’s 100% pure, therapeutic-grade essential oils. Contact me to learn more and place an order… But hurry, they’re going fast! No worries if you’re new to Essential Oils… Free ebook!